All children need motivation to learn. 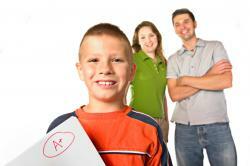 Have your child's grades decreased since he started middle school? Has his attitude about learning changed? Has the child that used to be studious turned into a slacker who doesn't seem to care? This often happens when children go to middle school. Let's find out why. There are several reasons why a child slacks off when he starts middle school. He's left the warmth of the elementary school environment and has entered a tumultuous school environment where he will face a host of challenges. Instead of having the same teacher for all subjects, he will have several teachers who each have their own set of rules and expectations and who will hand out a multitude of assignments, homework and projects. Besides these factors, your child must now work at having a social life and find time to take part in sports and other extracurricular activities. As if this isn't enough of a challenge to meet, many children who begin middle school find they have to keep up with all the latest fads because of peer pressure as well as raging hormones. Achieving a good academic average suddenly takes a backseat to all of these other issues. There is no instant way to motivate your child. For some, underachievement may go back their preschool years. Others may suffer from learning disabilities that are not recognized until they intensify when the child is faced with the challenge of middle school. First, take a good look at your child's lack of motivation. Has it always been a part of his nature or is it something new? Have there been changes in his home environment or within the family? Consult your child's teacher, guidance counselor and other school staff who interact with your child on a daily basis and gain their support in motivating your child. Praise your child's best efforts. Give rewards for positive attitude and best effort. Be a role model. Assure your child there is satisfaction in reaching his goals. Assure your child that it takes hard work and effort to achieve goals and that setbacks are common but can be overcome. Teach your child to keep all supplies for assignments and projects in one place. Supply him with a box or tote that has a lid. Supplies should include paper, pencils, pens, pencil crayons, markers, a calculator and other necessary items. Ask your child to let you know when the box needs to be replenished. Create a "Homework Nook" in your home where your child can do his homework. This is the place where all homework should be done at the same time daily. Teach your child to use a calendar or day planner to make a note of due dates for assignments and projects. Test and exam days should be marked with a highlighter in one specific color. Help your child develop a study routine. Make homework and school the highest priority. Homework should come before play. Be consistent. Both parents should set the same goals and rules for the child. Children will choose the easiest way if their parents' goals and rules differ. Give your child praise that is realistic. Use words such as creative, smart, hardworking and best effort. Never use words such as genius or perfect. Allow your child to be independent. Encourage him to make decisions that are age appropriate. Never allow your child to make decisions that are beyond their scope of understanding or capabilities. Allow your child to give an opinion but he must realize that you are the parent and you have the final say. Always be patient, positive and supportive of your child. He needs to know that you understand his plight and will be there for him. Encourage your child to express his feelings. Let him know that he can talk to you about anything. Encourage your child to explore his interests. Often, children will be fascinated with a certain subject and will pursue that interest into adulthood. Encouraging him to pursue his interests will keep him motivated. Celebrate even the smallest achievements. If your child struggles with writing and finishes a story, celebrate his victory. Focus on your child's strengths and encourage him to develop his talents. Knowing he can achieve his goals in one area will encourage him to explore and achieve in others. Use the tips in this article to transform your middle school slacker into a scholar. The results may amaze you.